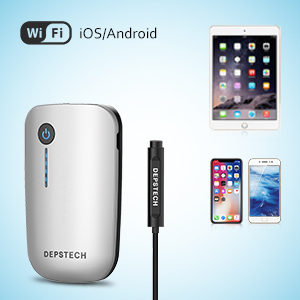 ★ Broad compatibility, working with any Android or iOS mobile devices, MAC and Windows PC via WiFi or USB connection ★ The detached WiFi-box and USB otoscope hurdle the devices limitations via two connection ways. WiFi emission will apply to Android 2.3+ devices or iPhone, even if they have two different ports. 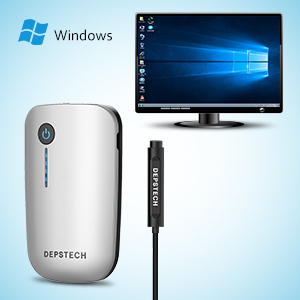 USB plug will achieve plug-and -play easy use, once you choose the correct software on your PC. ★ 720P Camera, providing clear images in the ear with non-heating chip ★ Superior to other digital ear otoscopes in the market, this unit can capture live picture and video at 1280×720, due to its 1.0MP lens. 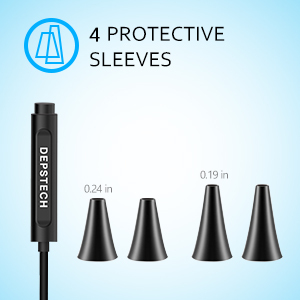 Featured with temperature control chip, the otoscope will not let the most sensitive organ feel burned at ease. ★ 6-Level Adjustable Brightness & Unique Blue LED Optimizing the Image& Video★ Tympanic membrane check will certainly contain darkness and the light will be necessary. 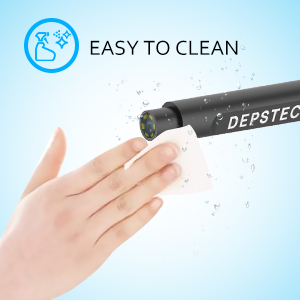 Adjusting blue LED light, the Depstech otoscope user can obtain better image and live video from close observation than other white light otoscope. ★ 1.8M cable and different size speculum, adaptable to diversified ear inspection for the whole family ★ It will be wrong for you to think that the unit can just be used on the adults. Especially designed different speculum will help you to do the exam for the every member at home, including your pets with the alcohol sterilization. ★Hidden novel functions, More fun and utilities from the built-in magnetic and LED torch ★ There are LED torch light and magnetic within the WiFi box, which makes the product more handy and useful in different application situations. 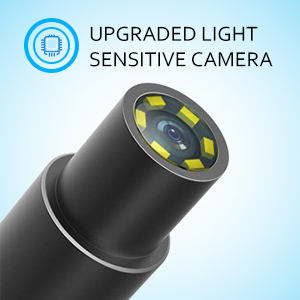 Along with 6 adjustable lights, specially desighed camera chip, the pictures and the video will be superior to those from other brands. As an inspection tool, the hygenie and cleanse will be highly important. 75% alcohol or water will be easy for you to prevent the unit from getting dirty. Attached specula in different dimensions, the unit will be adapted to kids small ear canal,and qualified for adults’ as well, saving much money for your family’s and your ear check. Open pre-installed software ” Smart Camera” to view the ear. Directly plug into USB port. Open built-in “Photo-booth” or pre-installed “VLC”. 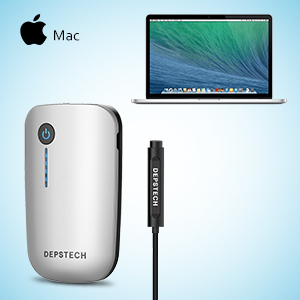 Turn on “Depstech” Otoscope WiFi box. 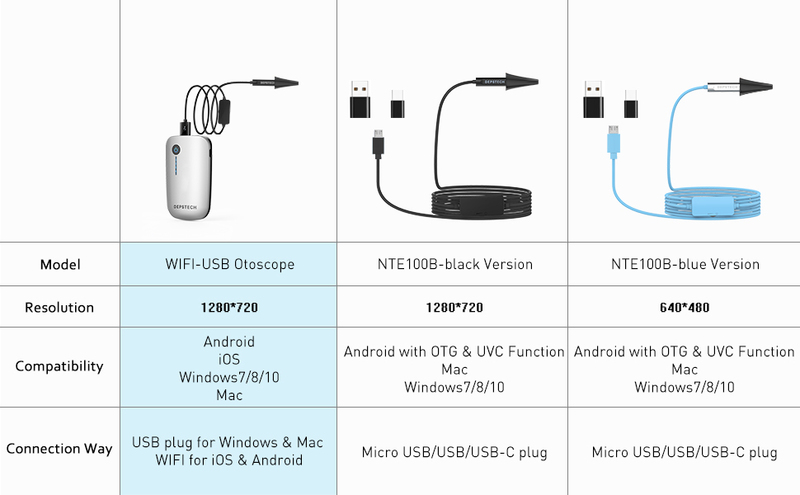 Join and connect the otoscope WiFi.